In "Nuclear Risk Reduction: Is Cold War Experience Applicable to Southern Asia?" Michael Krepon, President Emeritus of the Stimson Center, discusses the key elements of nuclear risk reduction during the Cold War. While acknowledging the differences between the US-Soviet experience and the conditions present in South Asia, Krepon argues that the key elements for risk reduction are applicable to the India-Pakistan-China triad. Leaders in these three countries argue that they will not repeat the Cold War mistake of bloated arsenals. 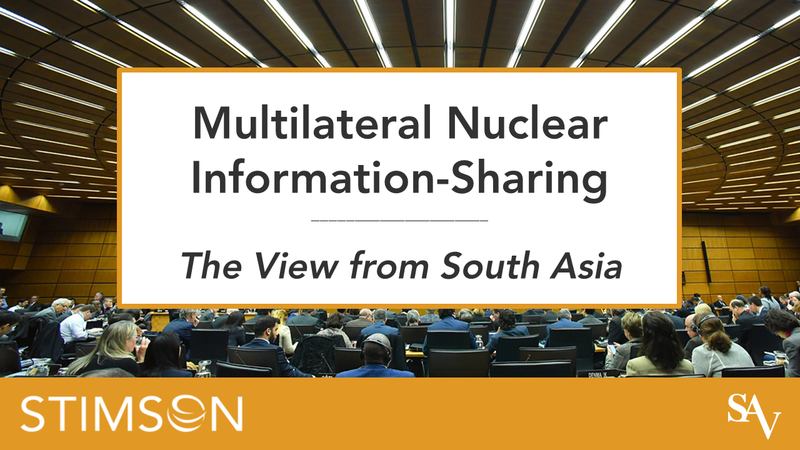 However, Krepon asserts, "if China, India, and Pakistan are to demonstrate a superior wisdom that resists ever-increasing nuclear capabilities, they must first demonstrate a superior wisdom to reduce nuclear risks." In "Nuclear Restraint, Nuclear Risk Reduction, and the Security-Insecurity Paradox in South Asia," P.R. Chari, Director of the Institute for Peace and Conflict Studies in New Delhi, contends that offsetting nuclear arsenals in South Asia have encouraged brinksmanship. Chari claims that there is a real danger of nuclear conflict between India and Pakistan because "the Kargil conflict revealed streaks of both rationality and irrationality by Indian and Pakistani leaders." He argues that "pursuing the weaponization and deployment option would introduce great instability in bilateral relations" between India and Pakistan. In "Nuclear Risk Reduction: Building on Common Ground," Chris Gagne, Research Associate at the Stimson Center, asserts that deterrence optimists and pessimists would both view the prospects of stable nuclear deterrence in South Asia with skepticism, particularly with the absence of nuclear risk-reduction measures. Gagne illustrates the commonalities in Indian and Pakistani views on risk reduction and proposes these as starting points to build a process toward implementing a nuclear risk-reduction regime. In "Missile Threat Reduction and Monitoring in South Asia," Kent Biringer of Sandia National Laboratories highlights the growing significance of ballistic missile-based threats in South Asia. Biringer suggests that the "introduction of missiles might serve to correct imbalances in nuclear or conventional capabilities," but warns that "as inventories and types of missiles increase and as they are deployed, there could be an escalation of tension." He argues that "agreement on monitoring and verification mechanisms would be an important element of moving forward on setting limits and minimizing threats" with regards to ballistic missiles and that "unilateral measures or limited scale cooperative experiments could be undertaken to demonstrate and evaluate the effectiveness of monitoring options." In "The Logic of Third Party Mediation over Kashmir," Harinder Baweja, a journalist with India Today, argues that a third party, such as the United States, could play a useful, and not unprecedented role in reducing tension between India and Pakistan-if both countries are willing to allow it. Baweja asserts that since its inception, "the Government of India has been paranoid at the thought of international intervention, interference, or even interest, in the Kashmir issue," but declares that "today, the very concept of a strictly bilateral approach is outdated and shortsighted." She suggests that a third party could help to facilitate discussions on some of India and Pakistan's most pressing bilateral issues as well as provide "legitimacy and staying power" to agreements that might otherwise become casualties of Pakistan's uncertain political future.